Visit "tvfool dot com" "dtv dot gov" or "antennaweb dot org" to check out the directions, distance and signal strengths of the available channels around your house. As this is an amplified antenna, you'll probably pick up clearer signals from 35 - 50 miles away. Also the frequencies of these channels should be within the antenna's frequency range. Make sure your TV has a built-in digital tuner, or you will need a set-top box to receive over-the-air HD signals. This antenna should be placed indoors and as high as possible, on or near a window for the best. 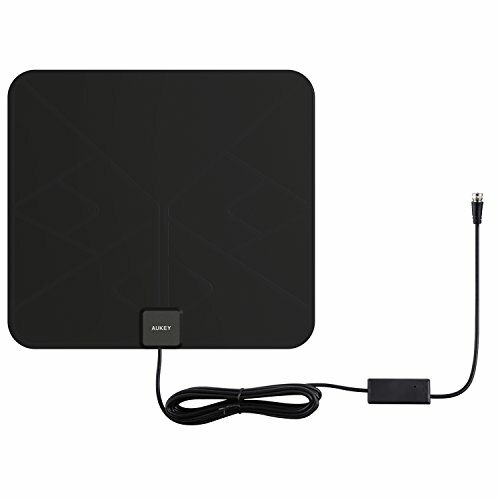 Face the antenna towards the direction which the most available channels or your favorite ones broadcast from, and avoid obstructions like hills, mountains, trees, buildings, etc. ATSC, DVB-T, ISDB-T, and DMB-T/H Digital Television Broadcast Standards & DAB/FM radio standards. If you have any questions about this product by AUKEY, contact us by completing and submitting the form below. If you are looking for a specif part number, please include it with your message.